If you find yourself in an unexpected underwater situation, what kind of knife would you want at your side? Honestly, you would probably be happy to have ANY knife with you. But obviously since you are reading this, you are someone that plans ahead, and you don’t want just any old knife, you want the best diver’s knife possible to well, survive with. The interactive chart of knives below and the analysis that follows will help you decide what the best dive knife is for you. We all have our personal preferences on what makes a good knife to go scuba diving with, but in an extreme situation you want the absolute best dive knife possible, and so we’re here to help. 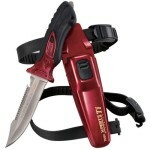 – Overall Length – combined blade and handle length in inches. What is a dive knife? Scuba knives are tools not weapons. You’ll never be snorkeling or diving along looking at a reef when out of nowhere you get swept into battle with giant squid or great white sharks. You’ll probably use your knife for nothing else but for untangling from abandoned fishing line. 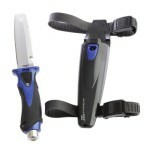 Because your dive knife is your one and only tools it would be great it to be versatile with a lot of functions. These knives have many sizes and shapes so it’s not easy to choose the right one. Maybe you’ll be attracted by some titanium and camouflaged big knife but when you find yourself in risky situation its look is the last thing you’ll think about. A relatively compact knife that’s easy to carry and doesn’t get in the way is really the best way to go. There are a few other things to consider when looking for the best scuba diving knife to fit your needs. 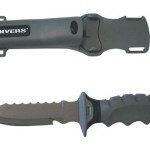 Fixed Blade – These are the most common dive knives you see. They come in all shapes, colors and sizes. The most important thing to look out for with this type of knife is how it fits in its sheath. If it doesn’t fit easily and securely you may be spending your dive looking for your dropped knife rather than watching that goofy parrotfish clowning around and harassing his fish buddies. 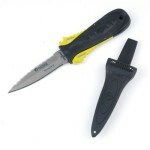 Folding Blade – Folding blade scuba knives are small and compact. They easily fit into a BC pocket or, depending on the sheath, strapped to your BC. Because they fold into themselves there is less of a risk that the tip could punch through the sheath and after that your suit or BC. One downfall is that they might be a little hard to open and close if you’re wearing gloves. 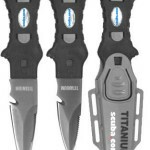 Steel vs. Titanium – Titanium knives are light, strong and rust proof. They’re also more expensive and harder to sharpen. 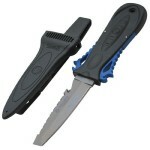 The main benefit of these scuba knives are that they don’t rust leaving you with little to no maintenance. Steel knives are cheaper and hold a much sharper edge than titanium. They’re easier to sharpen and as long as you maintain them you can keep them from rusting. 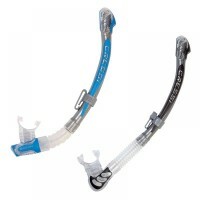 Usually you buy a scuba knife in either 300 or 400 series alloy. 300-Series – More corrosion resistant but it loses its edge quicker. 400-Series – Stays sharper longer but more susceptible to rust. Straight Edge vs. Serrated – There is no either or here. A good dive knife will have both. Period. Remember, it’s a tool, and the more versatile the better. Both types of edges will cut different materials more effectively. Blunt Tip vs. Sharp – With a sharp tip scuba diving knife there’s always a danger of putting a hole in something that you might wish you hadn’t. Also if you need to pry at something a sharp tip can get bent or even break off. 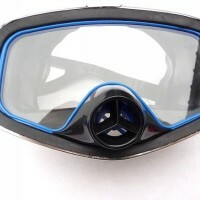 As a tool for scuba diving a blunt tip is a more versatile and safer option. Line Cutting Notch – Yes please! 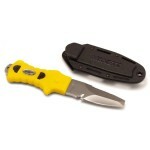 Sheath and/or Attachments – Make sure your dive knife fits securely and easily into its sheath. Whether you carry it strapped to your leg, arm or BC, tucked in a pocket or clipped with a carabiner to a d-ring, try to make sure it’s comfortable, easy to reach and out of danger of entanglement. Metal Handle But – Not necessary but it adds to the versatility of the knife. You can use the metal but to bang on your tank and get your buddies attention before that sneaky enemy spy takes them out. At the end of the day you may find that you never, or very rarely, use your scuba diving knife. But isn’t it better to have the tool and not need it than need it and not have it. Scuba knives are a relatively inexpensive piece of gear that can help to make a dive safer and more enjoyable. Now that you have seen the options and reviewed our top picks for the best dive knife on the market, its up to you to pick what meets your needs, is in your price range, and overall help you gear up for your underwater adventures. As you know, new knives are being created all the time by new and old manufacturers. For that reason, the comparison chart above will be updated as new knives need to be added to the list. Or if you feel like we missed a superior blade that needs to be included on the list, let me know in the comments below!